Charles Schultz once wrote that "happiness is a warm puppy". For anyone who loves dogs as much as I do, this quote clearly conveys the joy that our four-legged furry friends bring us. But I also think this quote can be interpreted to mean that it's the simple things in life that bring us the most pleasure. For example, something as simple as discovering a colorful wall or exploring a place, which is what I did the day these photos were taken, brings me a lot of happiness, albeit not as much happiness as my puppy William brings me. What else brings me happiness? Well, the little details in my wardrobe bring me happiness. 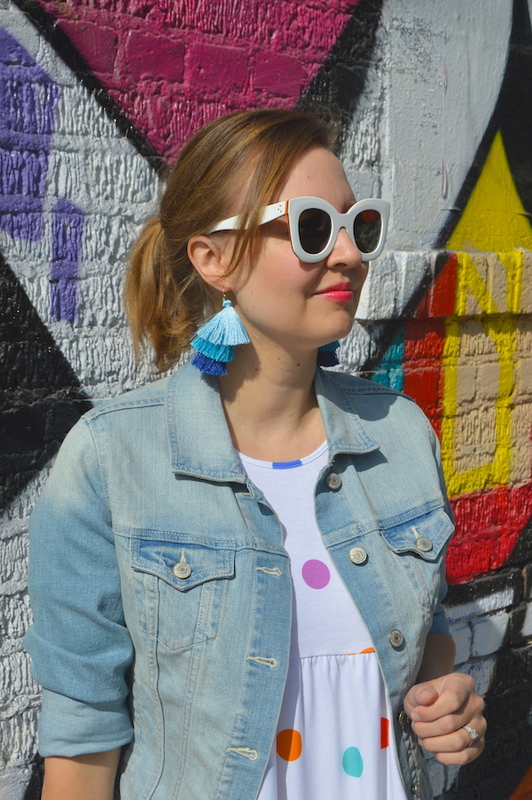 A great pair of earrings, for example, such as these blue ombre tassel earrings from the Happiness Boutique, definitely help me complete my look! 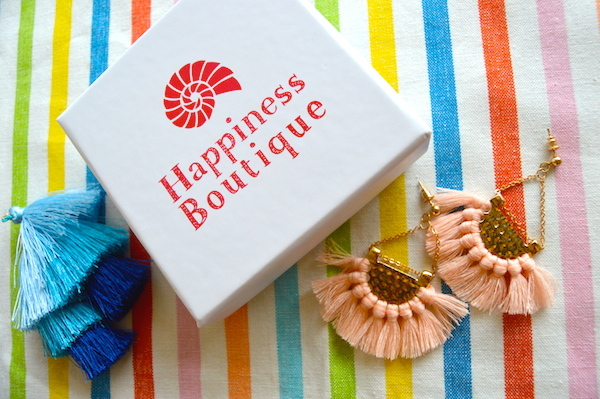 The Happiness Boutique has a great selection of jewelry in both trendy and classic styles, including an amazing selection of earrings from which to choose. To top it off, the Happiness Boutique offers free shipping and has a great rewards program for repeat customers. I also received the cute pink boho earrings pictured above from them! As you can see, I am really loving the tassel trend! Luckily, the prices at the Happiness Boutique are very reasonable, so you don't have to feel guilty indulging in your jewelry obsession! Speaking of which, my readers can save 10% on orders over 19 Euros from now to December 2nd with code: hellokatiegirlblog, so please check them out! 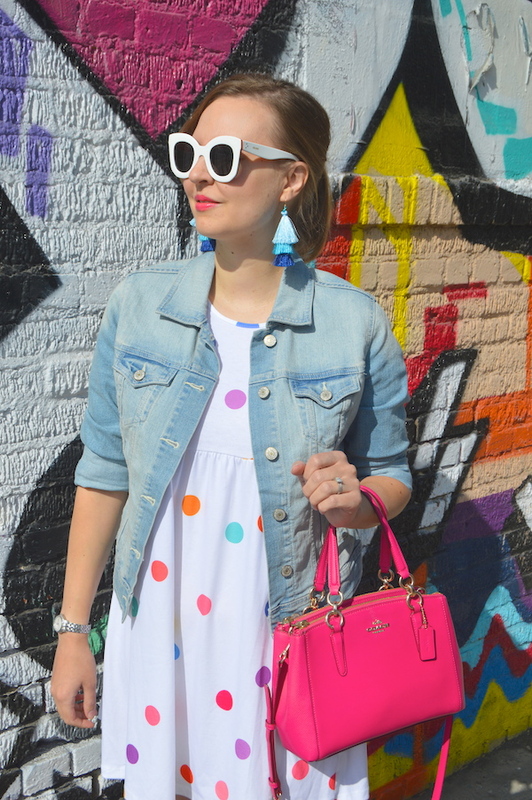 One last thing that brings me happiness are polka dots, especially multi-colored polka dots! This polka dot dress from ASOS is super cute, although if you're on the taller side like myself, you might find it a bit short and consider wearing it as a shirt instead. Originally, I wanted to take these photos against the backdrop of the famous polka dot covered wall by The Most Famous Artist, which is located in the Arts District of Los Angeles. (If you haven't seen it, it pretty much looks exactly like my dress!) Unfortunately, the wall is no more, as not only is it blocked off but it is also completely painted over! That does not bring me happiness! But, in keeping with the theme of this post, I am going to focus on the positive rather than dwell on the negative, and this new wall and this outfit both bring me happiness! 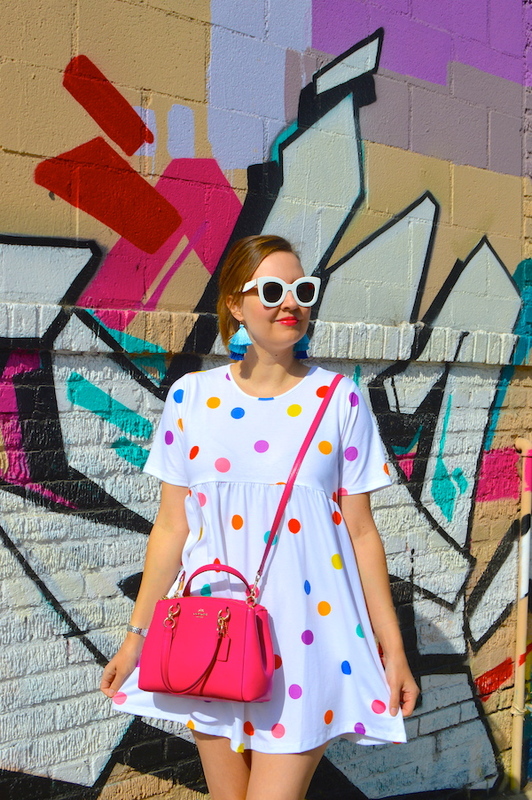 I am in love with this polka dot dress, so colorful and fun! Beautiful look, great post and another fabulous wall! Okay I love that hot pink bag! It's just so cute and that pop of color is right on trend for fall! This is so cute! As usual, I am so jealous of your fun earrings! You totally rock all of these fun colors, and I love seeing them being brought into fall. So cute!